Yes, you did read that title correctly. Today we had a lunch of leftovers, and to bolster said leftovers, my dad pulled out perhaps the randomest thing I've ever seen in my life - pig's trotter from a can. He tells me that he used to eat it all the time as a child. 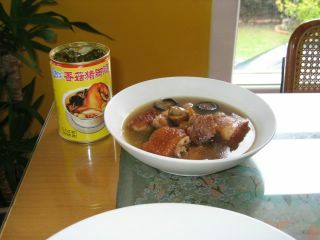 It's bits of pig's trotter and mushrooms in one of those thickly clear sauces that you get at Chinese restaurants. He just heated it up in a saucepan, and then it was ready to eat. I didn't try any - whilst technically I am back to eating pig, this just didn't look appealing at all. But the folks seemed to love it. I assume you can buy it at Asian groceries.